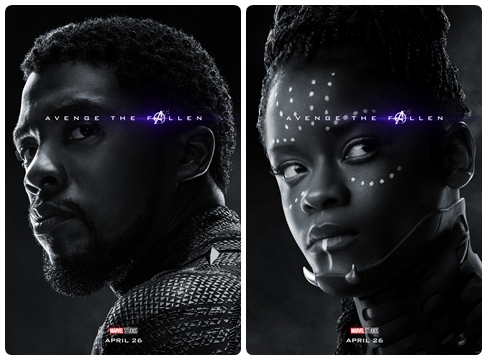 Let me continue by sharing the rest of the character posters below, which by the way, a couple may leave you with a bit of a shock. Don't worry, I'm definitely sharing my thoughts on that. The posters in color are those who survived to Thanos' finger snap. Those in gray hue, are those who vanished. Anyone else still finding it hard to get over it? This is my response: Neveeeeeeeeeer! 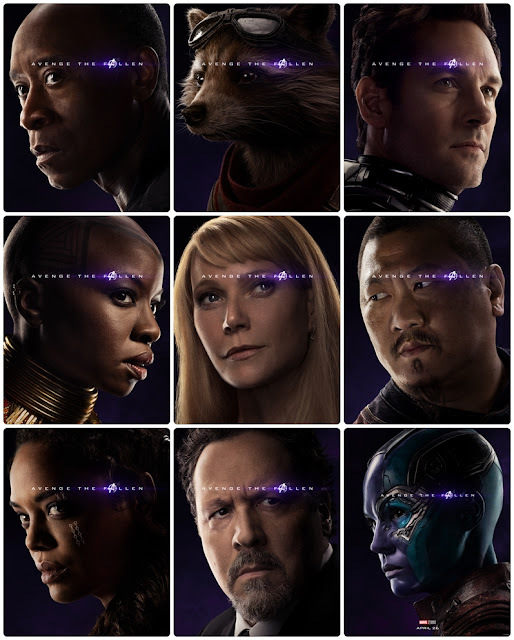 I'm so glad, that even though Thanos wiped half of the universe, there is still enough power in those who survived to avenge their friends. 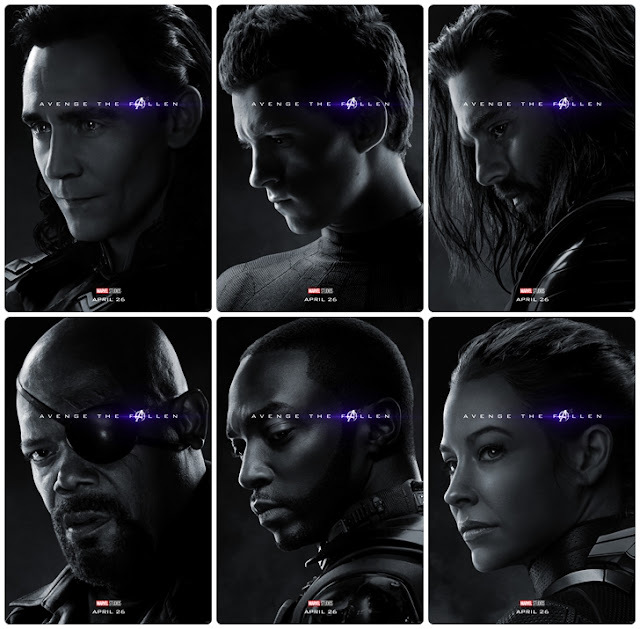 I am very excited for some characters that were not in the previous Avenger's movie, such as; Valkyrie and Ant-man. I think Ant-man is going to be a big surprise for some of the characters, as he had been missing (sorry, I can't spoil this much, you have to watch Ant-Man and The Wasp to catch up with this). I think his role in this film is going to be quite interesting. Okoye and Wong, two of my all-time favorites and I just can't wait to see them in action again. I personally feel quite sad for the character of Rocket. He lost all his family. So in a way, it would be interesting to see if he will keep on hanging out with Thor aka "Handsome Muscular Man", and the Valkyrie as well. Characters like War Machine, who never gave up, despite his incident during Civil War, and then Ms. Potts and Mr. Happy, even without a particular super power, are back in this film bringing with them one of the biggest powers of all; Hope. 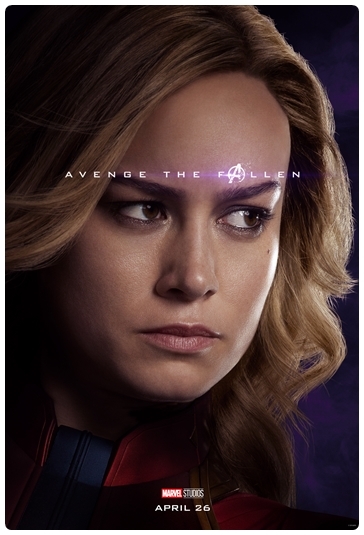 Now, let's not forget, the newest member of the franchise, which is technically not the newest-newest, but to find out why I am saying this, you'd have to watch her origin film; Captain Marvel. I just want to be her best friend! Can I, can I? I'm obsessed with Carol Danvers' character, and I think she might bring quite a few surprises to the Avengers' table in this film and the overall franchise. I think her comeback (oops, spoiler), will be of significant importance as we move on in the upcoming films. As I mentioned before, we just watched her origin film a couple of weekends ago, and can't get enough of her role. Therefore, I am super excited that I didn't have to wait that long to continue the story with Marvel Studio's Avengers: Endgame. Star-lord, you goofy, goofy man! *sigh. Well, love makes us do stupid things. Nonetheless, like Dr. Strange said: "There was no other way". After hearing him say this, I have to believe that regardless of all the loss,(and I am being super optimist here) it was the only way to actually defeat Thanos at the end. At least that is what I think. So, hopefully? Although each of the characters that vanished created a very emotional moment for many of us, due to how fond we have grown of them over this past decade, Scarlet Witch and Vision were a tough one for me. It was like no matter what, their love story was doomed to mirror our beloved Romeo & Juliet. This one got me so upset, darn you Time Stone! This second group shown above was interesting as they vanished. Well, Peter Parker and Bucky, to me, were very, very touching, at least in my opinion. Mostly because they didn't know what was happening and had that confusing look in their faces at the end. This is something I didn't see with let's say--the other characters like those from Guardians of the Galaxy. To me, their last expressions felt more like: "Oh no, here we go again". And well, if you've seen their previous two movies, you definitely understand why. With Falcon, it was so quick, I had to watch the movie again just to make sure they were not pulling my leg with the poster. None of the other characters even noticed that he had vanished right in that spot. That must be the saddest way to go. I still don't understand how Furry could keep himself together long enough to just act on what was happening, giving him enough time to send that last SOS. I mean, it seemed to me that Shield was very much out of the loop regarding Thanos' plan: Well done Nick Furry. When I grow up, I want to be just like you, Flerken and all *wink. Don't even get me started on The Wasp, ugh! I'm still very upset about it. However, the fact that Loki showed up in these posters has gotten some people speculating about theories on his death. I don't know how much those theories could be valid, I mean, just look at Gamora's case, and she is also in the posters. However, at this point in time, I cannot discard anything. Something that I've learned throughout the lifetime of this franchise, is that anything is possible. And by anything, I mean a.ny.thing (Is this where I'm supposed to drop the mic?). How can there possibly be "Wakanda forever" if the heirs are gone!! No, no, no, no! How many no's does it take to get over it? Just so that I can keep count, because I just can't stop shaking m head from side to side. Come on Marvel Studios! You can't make a super awesome film like Black Panther, only to follow it up with this. I'm dying here. Haha, can you tell I'm a huge fan of this particular film? Well, we did see T'Challa disappear, but not Shuri! Why Shuri? Okay, that would be like saying "Why anyone?" It just came as a huge surprise, because just when we thought we had caught up with everything Avengers:Infinity War and moving forward towards Endgame, then we get hit with this just a month before the release of the film. Well played Marvel Studios', *claps, *claps, well played. You really know how to keep us with all the emotions pouring out, as we get ready for some closure-- perhaps? Pretty please? Ay no! I got so teary when it was his turn. But I have to believe he was wise enough to let things happen the way they were meant to, and that is why his last words were those he said. He seemed sad but also confident that it was in fact the only way to stop Thanos. History has taught us, that like in any war, there are sacrifices to be made. However, we've also learned to grasp on to hope. Thus, I am hoping that all will be well at the end. That all will be fixed somehow. I mean, come on, I have my theories too. There are super powerful characters in the franchise, some can even manipulate time. I have a lot of expectations from Wong. Besides, I did cheat a little, because I know that Dr. Strange 2 is coming soon, haha. Although now that I think about it, that doesn't give me any guarantees, as some of the movies that have come after the fact, the Thanos fact, have been from before the chaos. Still, I'm #TeamWong & #TeamStrange all the way. I believe that no matter how little a character thinks they can do, considering that some don't really have powers like Captain Marvel, or Thor, or super strength like the Hulk, they have courage, so strong, that it does give them the ability to do as much and maybe even more than anything we could hope for. And thus, this time, I want to leave the movie theater with my heart in my chest (where it belongs), and not rolling down on the ground like last time, haha. So here's my question to you, how are you preparing for Marvel Studios' Avengers: Endgame? 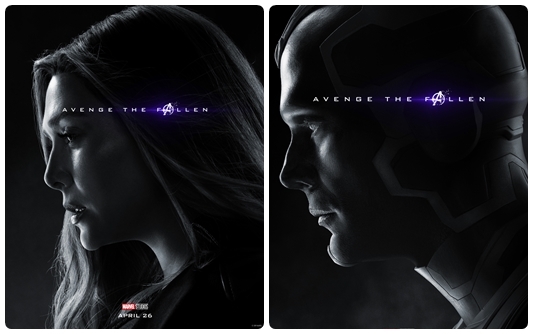 Okay, after our thoughts regarding the posters, which by the way are awesome, what are your theories? I'd love to read them, no matter how crazy or odd they may seem. 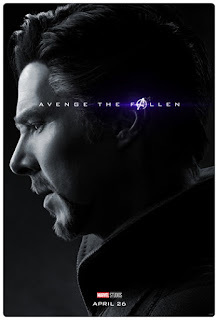 Remember that throughout these past decade, we have learned to expect the unexpected from all Avenger films. That is something I have actually enjoyed over the years, because something that people around me knew about me, was that it was really hard to surprise me in a film. At some point, I knew exactly what was going to happen, which was annoying at times, even for me. I love being surprised in films, even if it is with upsetting events. I love discovering unexpected outcomes, and something a bit more connected to real life, which is that not every story has a happy ending. 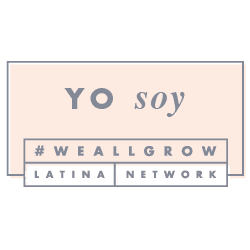 And while, I am not trying to be pessimistic about it, I believe this is why we get to connect so well with these films, because at some level, we can relate to the stories and characters. It's been a wonderful journey so far. I honestly can't wait for Endgame to come out, and to see what's next. One thing I know for sure, I want to grow old with these movies, so considering there are so many characters in the MCU, I expect nothing less than Avengers forever. 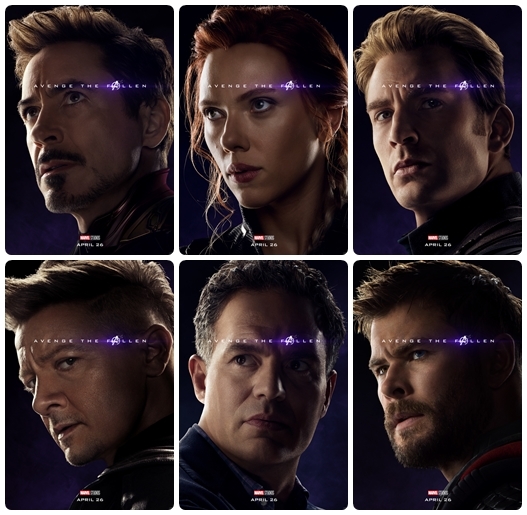 Don't forget Marvel Studios' Avengers Endgame will be playing in theaters across the United States on April 26th, 2019. I think it's going to blow our minds. Until then, and do expect our review on the film, remember to subscribe, or follow us via social media. And smile, because it's contagious and that's also a super power.